Since there are many questions about the way the TIOBE index is assembled, a special page is devoted to its definition. The ratings are calculated by counting hits of the most popular search engines. The search query is executed for the regular Google, Google Blogs, MSN, Yahoo!, and YouTube web search for the last 12 months. The web site Alexa.com has been used to determine the most popular search engines. The number of hits determine the ratings of a language. The counted hits are normalized for each search engine for the first 50 languages. 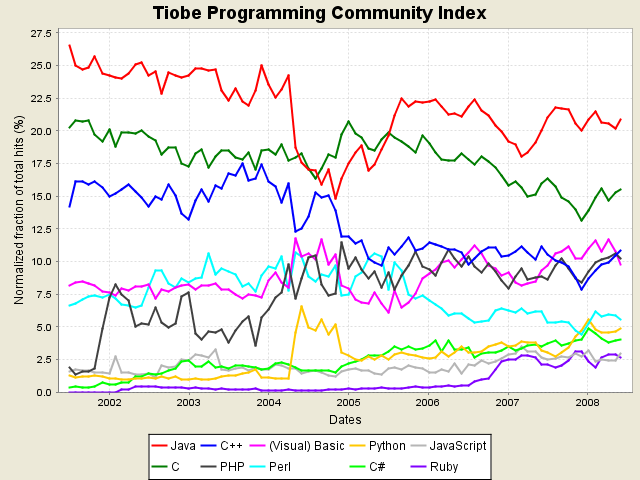 Besides the rating of programming languages, there is also a status indicated in the TIOBE chart. Programming languages that have status “A” are considered to be mainstream languages. Status “A-” and “A–” indicate that a programming language is between status “A” and “B”. If a programming language has a rating that is higher than 0.7% (yes, this number is arguable but we had to fix it somewhere) for at least 3 months it is rewarded status “A”. The first two months the programming language will receive status “A–” and “A-” respectively. The opposite holds for languages that go from status “A” to status “B”. So if a language had status “A” 2 months ago, a rating of “0.607%” last month and a rating of “0.687%” now, it will have status “A–“. Programming languages that are very similar are grouped together. Currently the maximum of the hits of the individual languages is taken into account when calculating the ratings of groupings. In the future we will do a better job and take the union (from mathematical set theory) of all the hits. No wonder Java tops the ranking. And it will continue to hold that position for some time to come. What I am surprised to see there was Pascal is gaining popularity and people are using it nowadays. You can see the list of top 50 languages here. Which is the Hottest Java Web Framework? The “Break it Down” Blog has a lengthy post on Which is the Hottest Java Web Framework? Or Maybe Not Java? Comparing Java Web Frameworks is hard because so many people are passionate about the framework they know best. Add a couple more like Flex and Ruby on Rails and its downright difficult. Nevertheless, this post is good in that it contains a lot of pretty trend graphs and it looks like the author has done some good research. It’s likely the folks that will scream foul are the ones that did poor in the comparison (Tapestry and Stripes, I’m talking about you). Surprising among the top Java Web Frameworks is the rise of Struts 2. Which is much more interesting I think is how Wicket adoption has stayed almost flat while Struts 2 adoption has spiked. Spring MVC/WebFlow seems to be going no where fast and racing JBoss Seam there.The popularity of Struts 2 really caught me off guard with it being quite a bit different from Struts 1, I figured it got thrown into the “just another web framework” category, but I guess there is something in a name and it’s doing quite well. Java Launcher is a powerful Java tool which can run java applications and applets by double-clicking class files in explorer as if they are normal windows executable files. Java Launcher includes nine features totally. Six features in Windows explorer: Run Java applications and applets by double-clicking class files; view class source codes and class hierarchies in graphic format by right-clicking; display contents of jar and zip files without extracting them by right-clicking and allow to save selected files from jar or zip to disk; compile thousands of Java files by right-clicking, execute and debug thousands of applications and applets by right-clicking. Two features of creating: create Windows EXE files from Java applications with user icons, arguments of Java main method, system and user classpaths; create executable JAR files. Last feature is named Java-Help-System, which can auto generate an advanced Help System for J2SE documentations without spending user’s any time and energy. Java Kernel is a new distribution aimed at getting Java software up and running faster. Instead of a full JRE, users download a small installer (the “kernel”) which includes the most commonly needed JRE components. Additional components are downloaded as needed, and the JRE will download remaining components in the background and then reassemble itself. More information about Java Kernel can be found in the 6u10 FAQ. Java SE 6u10 includes a brand-new implementation of the Java Plug-in, which is used by default as long as you are using Firefox 3 or Internet Explorer. The next-generation plug-in runs applets outside of the browser in one or more separate processes. Applets still appear inside of the web browser window as they always have, but this means that it is now possible to use different JRE versions, command-line arguments, and configurations to run different applets. The isolation provided by running the web browser and the JRE — two very large, very complex pieces of software — in separate process spaces improves the reliability of both, and gives applets the same flexibility and control over JRE configurations that other Java software has always enjoyed. Much more information about the new plug-in can be found in the release notes. More documentation about the deployment toolkit can be found here. Metal look and feel for Swing was the only competition for the Windows 95 interface in Java. Given the state of graphical user interfaces a decade ago, Metal was an attractive and elegant alternative to the other common interfaces of the time. The updated Ocean theme in Java SE 5 helped to keep Metal a viable choice up to the present day, but it’s time for Swing’s cross-platform look and feel to get an overhaul. Enter the Nimbus Look and Feel. A brand new, modern look and feel based on Synth, Nimbus provides a polished look to applications which choose to use it. And because Nimbus is drawn entirely using Java 2D vector graphics, rather than static bitmaps, it’s tiny (only 56KB!) and can be rendered at arbitrary resolutions. to the file <JAVA_HOME>/lib/swing.properties. You will have to create the swing.properties file if it does not already exist. For further reading about Nimbus, take a look at the Nimbus early access page. In computing, just-in-time compilation (JIT), also known as dynamic translation, is a technique for improving the runtime performance of a computer program. JIT builds upon two earlier ideas in run-time environments: bytecode compilation and dynamic compilation. It converts code at runtime prior to executing it natively, for example bytecode into native machine code. The performance improvement over interpreters originates from caching the results of translating blocks of code, and not simply reevaluating each line or operand each time it is met (see Interpreted language). It also has advantages over statically compiling the code at development time, as it can recompile the code if this is found to be advantageous, and may be able to enforce security guarantees. Thus JIT can combine some of the advantages of interpretation and static compilation. Several modern runtime environments, such as Microsoft‘s .NET Framework and most implementations of Java and most recently Actionscript 3, rely on JIT compilation for high-speed code execution. In a bytecode-compiled system, source code is translated to an intermediate representation known as bytecode. Bytecode is not the machine code for any particular computer, and may be portable among computer architectures. The bytecode may then be interpreted, or run, on a virtual machine. A just-in-time compiler can be used as a way to speed up execution of bytecode. At the time the bytecode is run, the just-in-time compiler will compile some or all of it to native machine code for better performance. This can be done per-file, per-function or even on any arbitrary code fragment; the code can be compiled when it is about to be executed (hence the name “just-in-time”). In contrast, a traditional interpreted virtual machine will simply interpret the bytecode, generally with much lower performance. Some interpreters even interpret source code, without the step of first compiling to bytecode, with even worse performance. Statically compiled code or native code is compiled prior to deployment. A dynamic compilation environment is one in which the compiler can be used during execution. A common goal of using JIT techniques is to reach or surpass the performance of static compilation, while maintaining the advantages of bytecode interpretation: Much of the “heavy lifting” of parsing the original source code and performing basic optimization is often handled at compile time, prior to deployment: compilation from bytecode to machine code is much faster than compiling from source. The deployed bytecode is portable, unlike native code. Since the runtime has control over the compilation, like interpreted bytecode, it can run in a secure sandbox. Compilers from bytecode to machine code are easier to write, because the portable bytecode compiler has already done much of the work.